One of the first heavyweight clashes of the season ended as a contest with the 37th-minute dismissal of Liverpool’s Sadio Mane after a dangerous boot into the face of Man City goalkeeper Ederson. The hosts, already a goal up through Sergio Aguero, played some exhilarating football on the way to a bloodless 5-0 victory. Gabriel Jesus and the excellent substitute Leroy Sane both grabbed two goals as Liverpool capitulated in the face of a light blue onslaught. 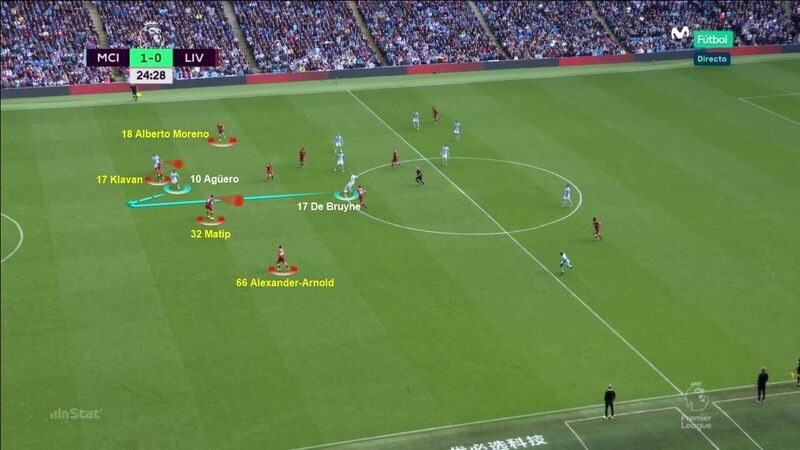 Pep Guardiola started with a 5-3-2 formation and City employed a consistent high press, initiated by Gabriel Jesus and Sergio Aguero, with the intention of forcing the Liverpool defenders to play direct. 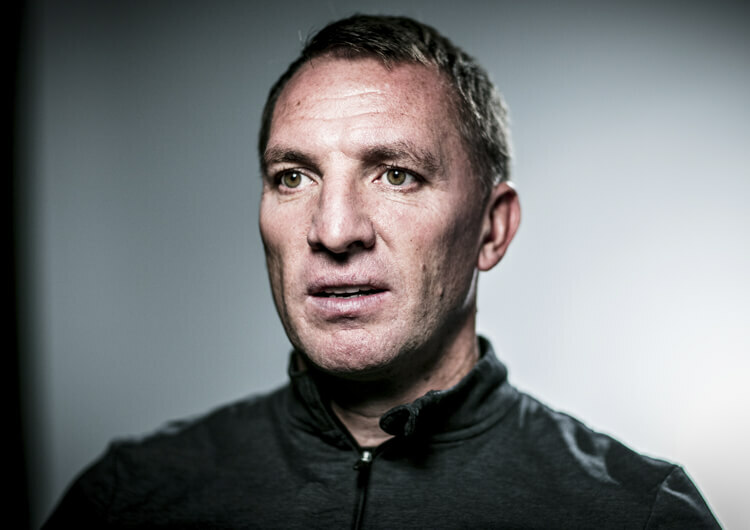 After Sadio Mane was sent off on 37 minutes and City scored again in the second half, Guardiola changed to a back four, with Danilo moving from a back three into central midfield, alongside Fernandinho. Jesus came off after scoring the third goal, to make way for the impressive Leroy Sane, meaning they finished the game in a 4-2-3-1. 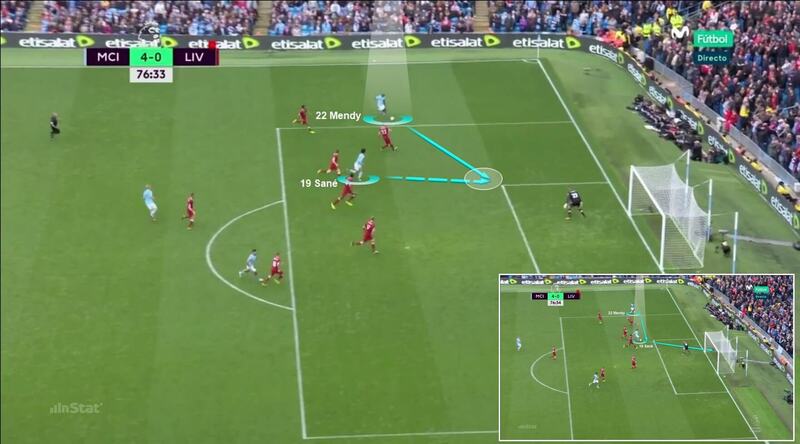 City showed a constant willingness to press and intercept inside the Liverpool half. In their own half, their defensive line came under threat from Mo Salah on the right, as they found it difficult to defend against his runs – and Liverpool passes – into the space between Nicolas Otamendi and the left wing-back Benjamin Mendy. Since the home side’s clear attacking intentions left them with few men behind the halfway line, they tried to win the ball back immediately after losing it, stifling the play in nearby areas. 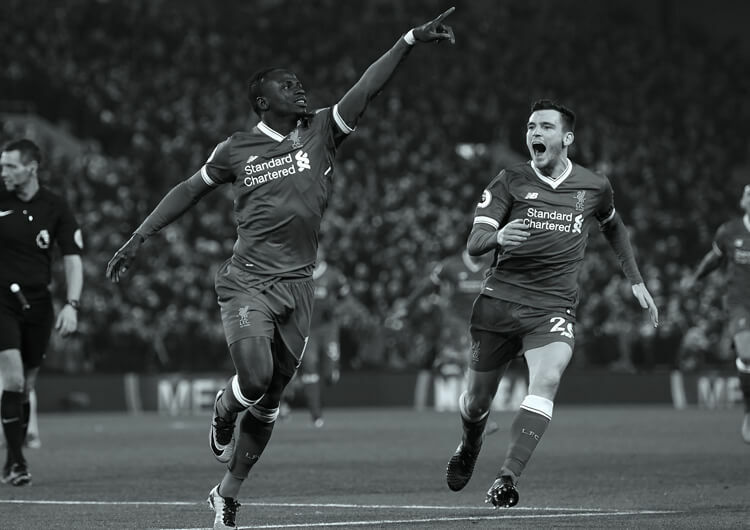 Following the dismissal of Mane, however, with an advantage in terms of men and scoreline, they were rarely exposed and did not suffer on the counter-attack. In attack, goalkeeper Ederson (who was eventually replaced by Claudio Bravo after his injury) worked with the three centre-backs to build City’s dominance from defence. 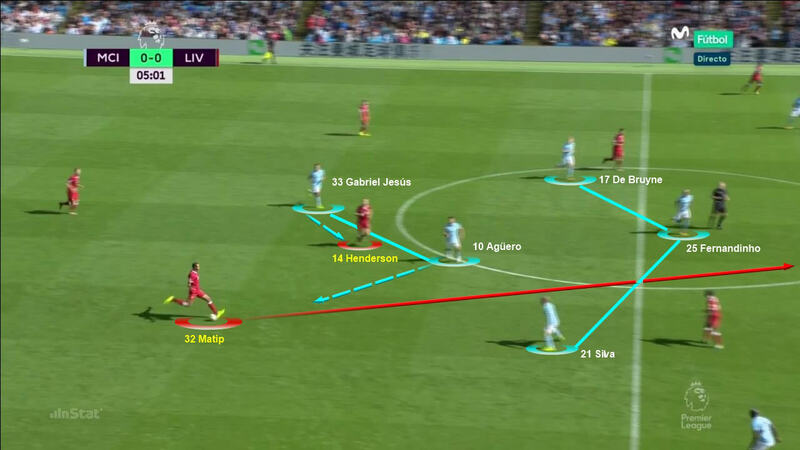 Liverpool tried to challenge their back line by pushing them out wide and managed it relatively well while it was 11 against 11, with their midfielders cutting out potential attacks from Kevin De Bruyne and David Silva in central areas. But City found it easier to find these free players in behind using their numerical advantage in the second half. In the final third, they were capable of penetrating gaps in the last line of defence, making the most of the red card and Liverpool’s ensuing defensive weakness. This ensured they could create numerous avenues of attack for Jesus, Aguero or Sane, who produced a standout display as a second-half substitute. Left wing-back Mendy was the source of considerable threat down his flank – goals by both Jesus and Sane came as a result of this. It is also worth noting City’s offensive transition after recovering the ball, rapidly looking for a counter-attack to take advantage of any imbalances in their rivals’ defensive structure. Aguero, Sane and Jesus, whose second goal is a prime example, were most effective through their breakaway runs in between and behind the last defenders. Manchester City in their 5-3-2 shape. 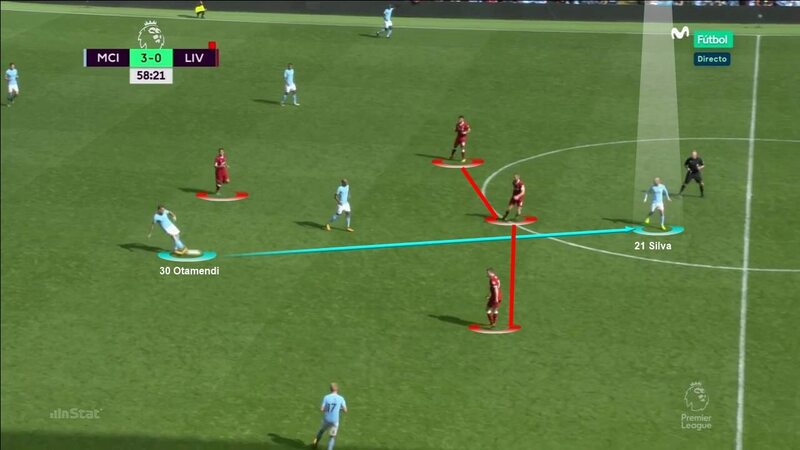 They employed a consistent high press, initiated by Gabriel Jesus and Sergio Aguero, with the intention of forcing the Liverpool defenders to play direct. After Mane was sent off, Guardiola changed to a back four, with Danilo moving from centre-back to join Fernandinho in midfield. 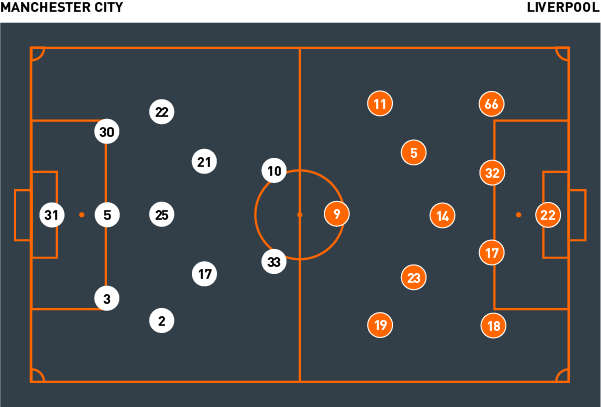 While it was 11 against 11, the Liverpool midfielders were able to cut out potential attacks using De Bruyne and David Silva in central areas. In the second half, with a man advantage, City found it easier to find them. Left wing-back Mendy posed a huge threat with his forward runs, creating goals for both Jesus and Sane (above) in the second half. 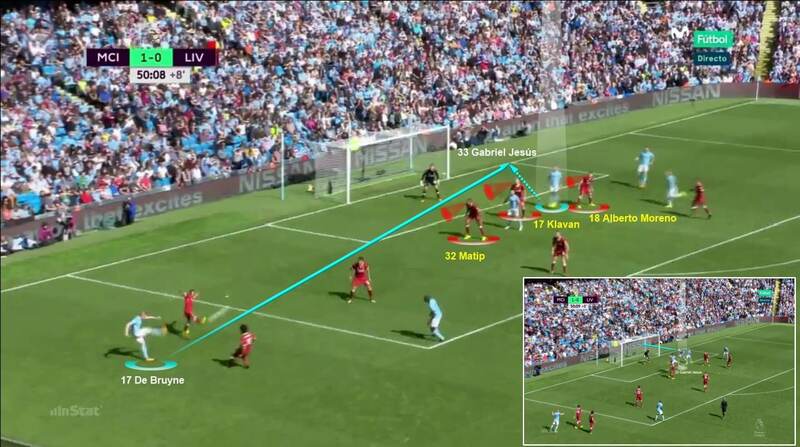 City looked for counter-attacks to take advantage of any gaps in the Liverpool defence. Aguero, Sane or Jesus, whose second goal (above) was a prime example of this, were most effective at finding space between or in behind. 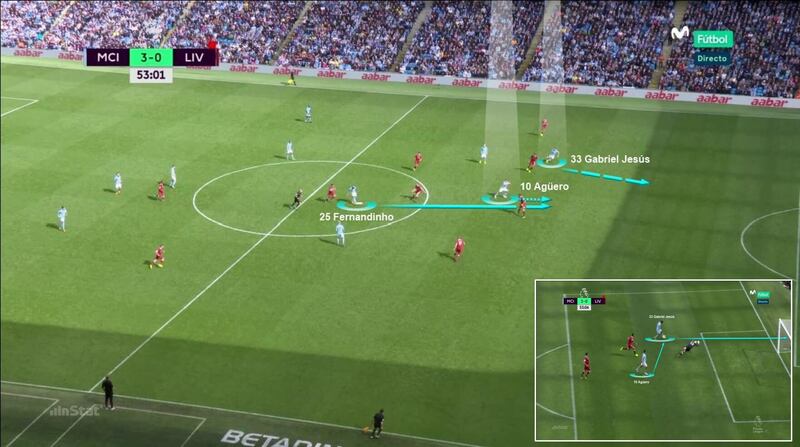 When City attempted to play out from the back, Liverpool pressed high and tried to disrupt them. 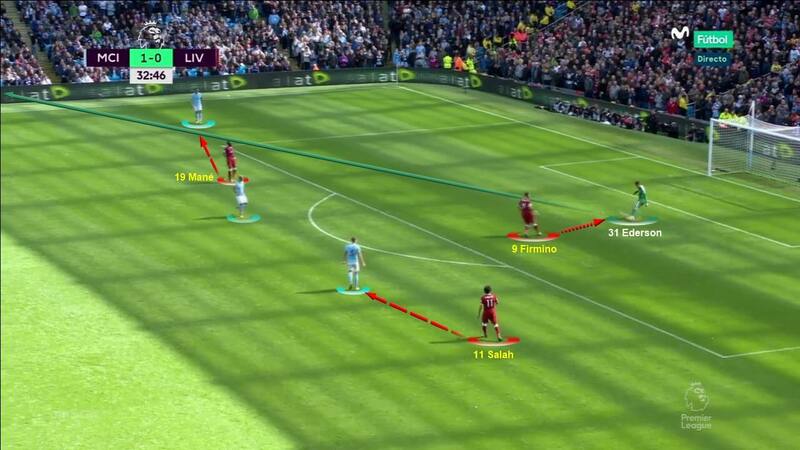 Their pressing game always began with Roberto Firmino, shutting off pathways through the centre and forcing the Ederson and the back three to go wide. Here, the goalkeeper misdirects his long ball towards Walker. After Sadio Mane was sent off on 37 minutes and they conceded early in the second half, Klopp retreated into a 5-3-1, with Emre Can at centre-back in between Joel Matip and Ragnar Klavan. 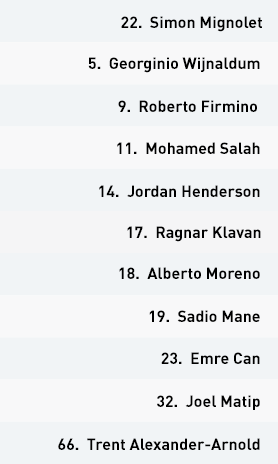 Liverpool's defensive frailty, above all in their last line of defence. The Reds showed weakness in dealing with dangerous runs into space from the City attackers. This image shows the defensive imbalance between the centre-backs. There were notable lapses of concentration while marking or tackling on the edge of the penalty area, as the Liverpool defenders watched the ball and not the players. Here, the mistake leading to City's second goal from an unmarked Jesus. The performance of Mo Salah in the first half, whose dribbling and repeated runs into the gaps in the City defence were a real threat. He found particular success in the space between Otamendi and Mendy. Jurgen Klopp started in his usual 4-3-3 formation, switching to 4-1-4-1 in defence. 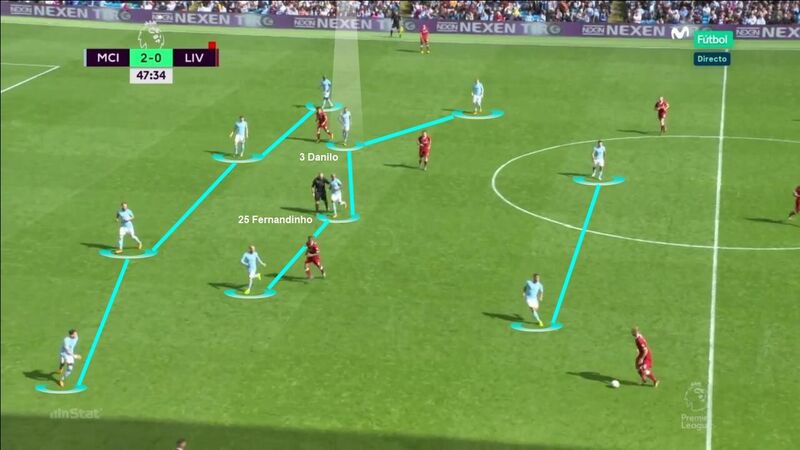 When Manchester City attempted to play out from the back, Liverpool pressed high and tried to disrupt their opponents. 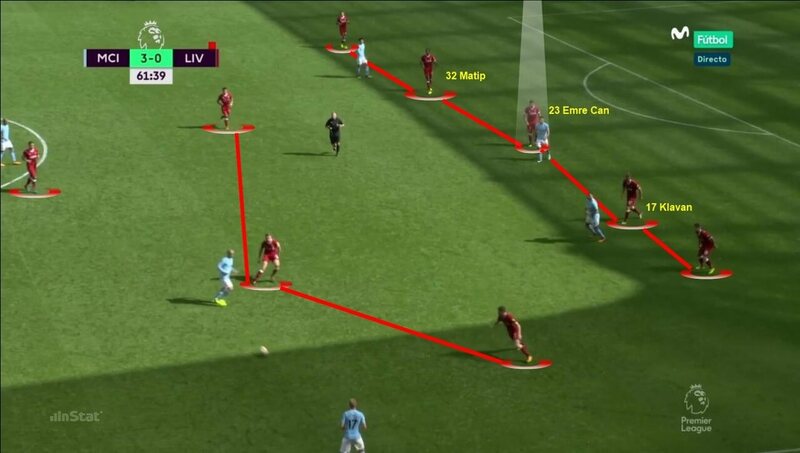 Their pressing game always began with Roberto Firmino, shutting off pathways through the centre and forcing the goalkeeper and centre-backs to play out wide. As soon as possession swung to the opposition, they pressed and try to win the ball back. After Sadio Mane was sent off on 37 minutes and they conceded early in the second half, Klopp retreated into a 5-3-1, with Emre Can at centre-back in between Joel Matip on his right and Ragnar Klavan on his left. They had been solid in midfield at 11 versus 11, working to outnumber the opposition attackers. 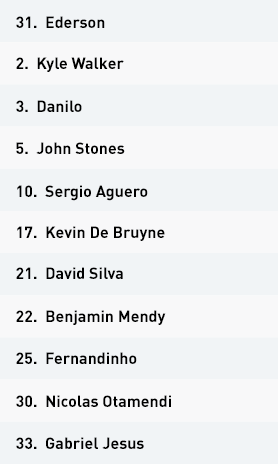 After going a man down, they were no longer able to prevent passes through their defensive unit – and City found it easier to find free players in behind, most commonly looking for Kevin De Bruyne and David Silva in intermediate areas. In the final third, Liverpool’s defensive frailty was obvious. 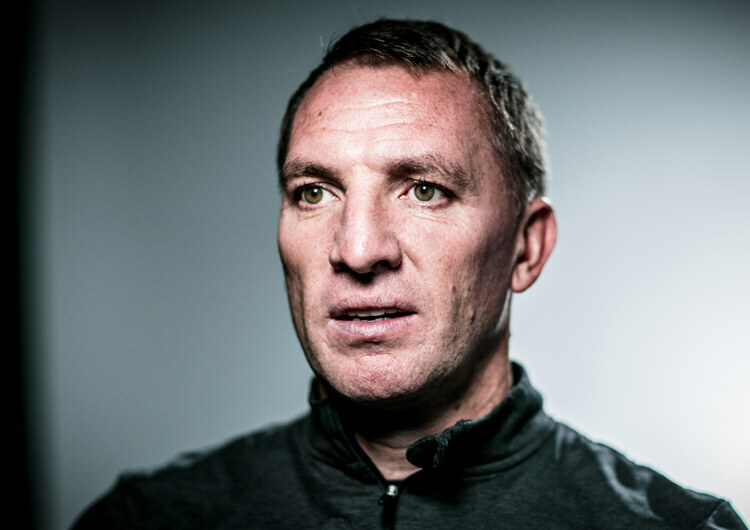 They couldn’t deal with dangerous runs into space from the City forwards, and fell prey to numerous lapses in concentration, often watching the ball and not the players. In attack, they tried to build from Simon Mignolet, Matip and Klavan at the back and beat the first lines of pressure as quickly as possible. If they ran into trouble, they looked direct to Firmino. They found it difficult to suppress their opponents in midfield, and losing a player made their task even harder, since it reduced their attacking options. This brought about the change of formation to 5-3-1 and the loss of a crucial man in midfield as Emre Can dropped into defence. The Reds had an attacking foothold in the first half through Mo Salah on the right, who had particular joy finding space in the gap between Nicolas Otamendi and Benjamin Mendy to the left side of the City defence. In the second half, though, they barely posed any danger to the replacement Claudio Bravo in goal. Ultimately, given they trailed and had 10 men for most of the match, they were never able to take advantage of any potential defensive weaknesses in the City formation. The dismissal of Sadio Mane on 37 minutes reduced all the options for Liverpool in trying to compete with Manchester City. Jurgen Klopp’s team eventually tired and succumbed to the attacking excellence of the hosts. Liverpool’s defensive frailty, as they showed weakness in dealing with dangerous runs into space from City. Multiple lapses of concentration blighted their marking or tackling on the edge of the penalty area, as they watched the ball without watching the players. Pep Guardiola’s willingness to adapt to circumstances. He started with Danilo at centre-back, who offered height and strength to counter the Liverpool attackers. 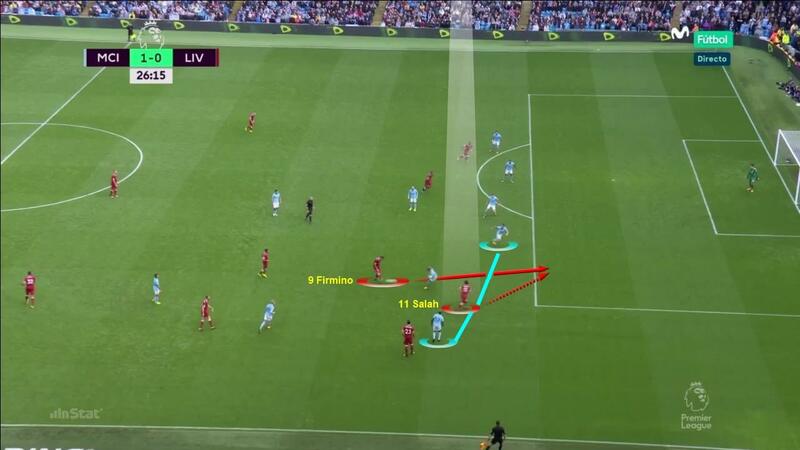 After Mane was sent off, he switched to a 4-4-2 and moved Danilo into midfield, and then later brought Leroy Sane on to add an even greater threat against a tiring defence. The performance of Simon Mignolet in goal, who produced a string of saves to prevent an even bigger – and more embarrassing – margin. The threat of Mo Salah in the first half, whose pace, dribbling and movement into spaces between the City defence caused a real problem as long as Liverpool retained 11 men on the pitch.